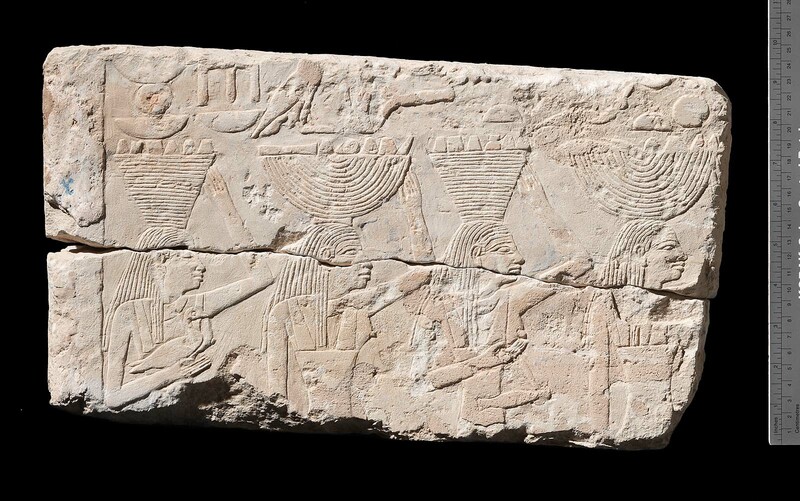 This rectangular slab, executed in fine, raised relief depicts the torsos of 4 female offering bearers facing the right. It joins 37.2761.1, .4, and .6. Overall 37.2761 contains two registers. The top register (.1-.5) depicts seven female offering bearers and piles of offerings before the legs of a seated figure at an offering table. The lower register (.6) contains five men butchering two oxen. From Giza, reused in building chamber of intrusive pit G 2423Y, Tomb of Mehu. 1937: Excavated by the Harvard University–Boston Museum of Fine Arts Expedition; assigned to the MFA by the government of Egypt.